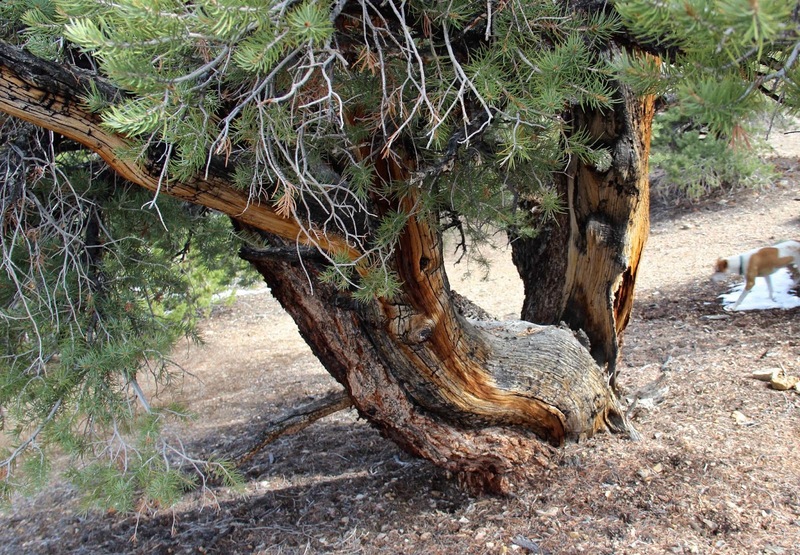 I guess it was a little odd … to go to the White Mountains and not visit the famous ancient bristlecone pines. But I was looking for singleleaf pinyons. A few weeks earlier I had hung out with two-needle pinyon pines on the Colorado Plateau. So I wanted to get to know this other pinyon. 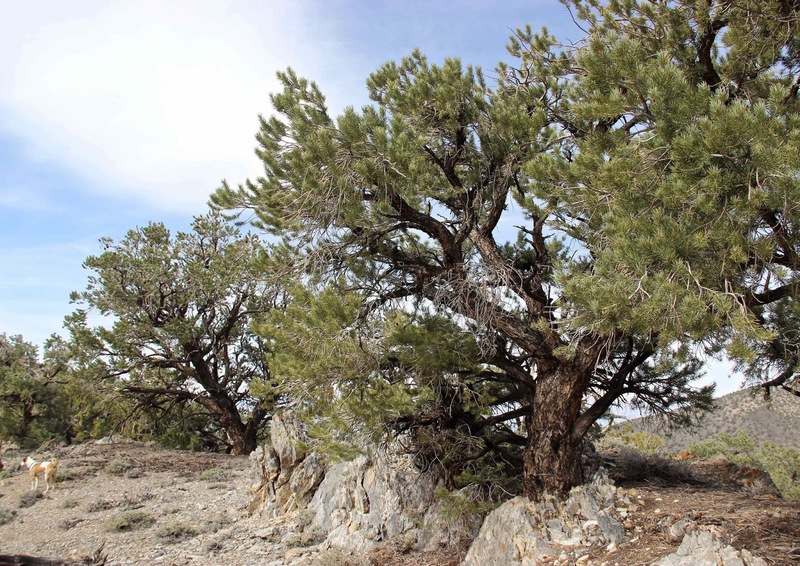 There are two common pinyon pines in the western US: the two-needle or Colorado pinyon (Pinus edulis) on the Colorado Plateau and Rocky Mountain foothills; and the singleleaf pinyon (P. monophylla) in the Great Basin and southern California. 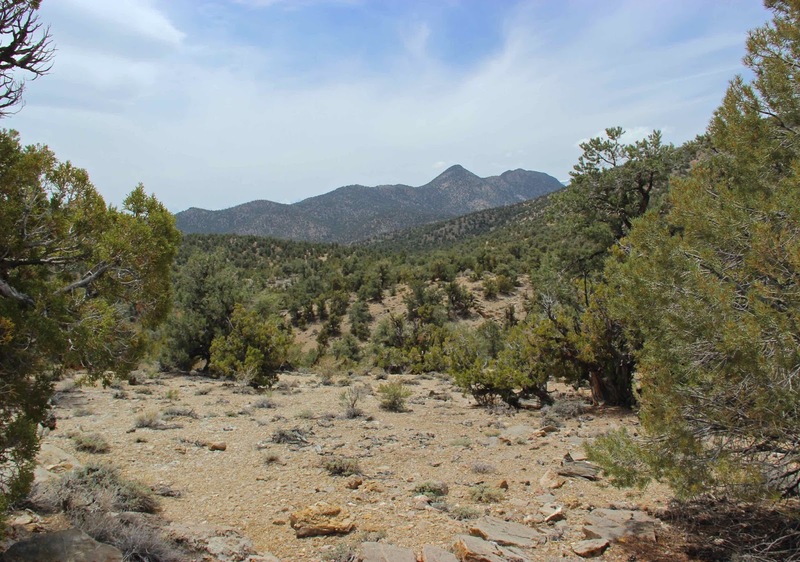 If you look east across the Great Basin from the White Mountains, you'll see range after range covered in singleleaf pinyon - Utah juniper woodland. This is an arid-lands kind of vegetation. 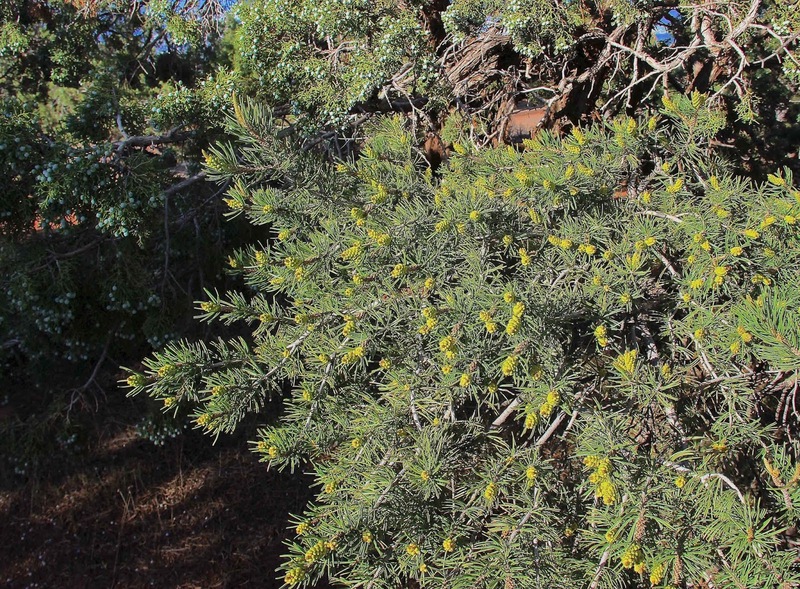 It grows in some of the driest pine habitat in the world (Waring 2011). 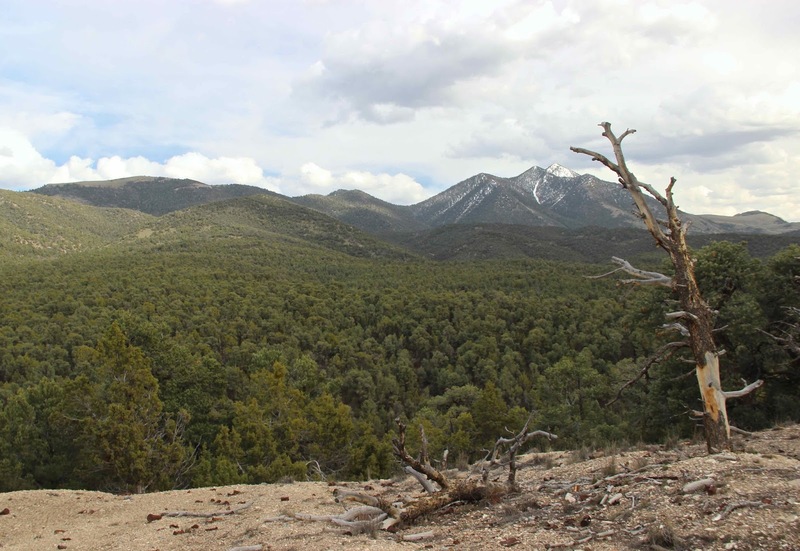 Yet pinyon-juniper woodland is common at higher elevations in the White Mountains – at 8, 9, 10,000+ feet where “normally” we'd find montane forest. But the Whites are dry. 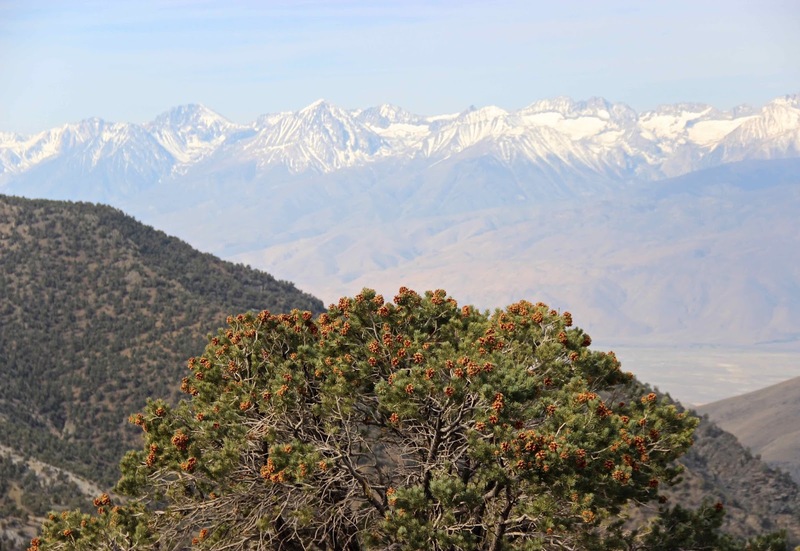 They’re only about 25 miles east of the mighty Sierra Nevada, which casts a giant rain shadow. 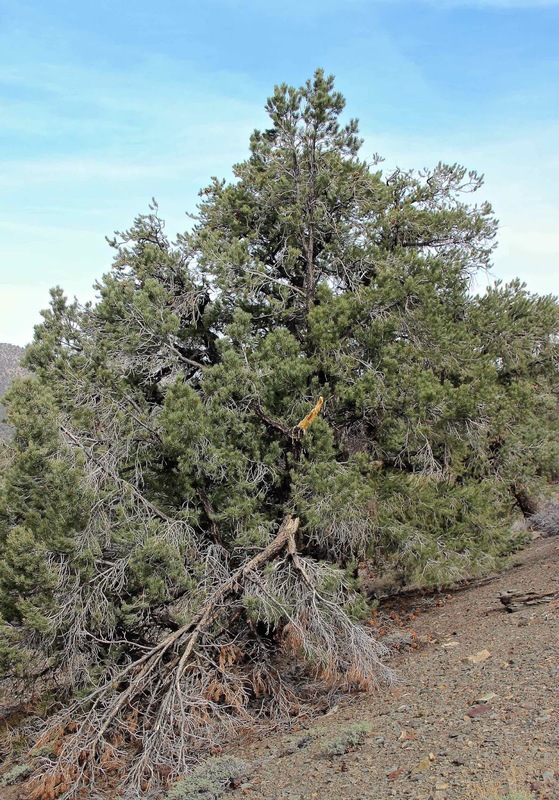 Westerly winds carry considerable moisture from the Pacific Ocean across California, and when the air bumps up against mountain ranges, it rises and cools and moisture condenses out as rain and snow. Then when the dried-out air descends on the east side of the mountains, it warms and expands and can hold more moisture. So there’s a rain shadow, especially behind the great Sierra Nevada (more information here and here). 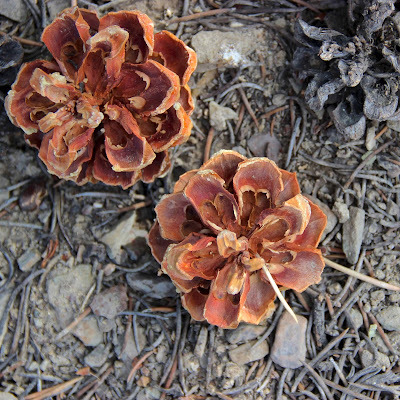 The area around Grand View Campground is quite dry, even though it’s at about 9000 feet elevation. 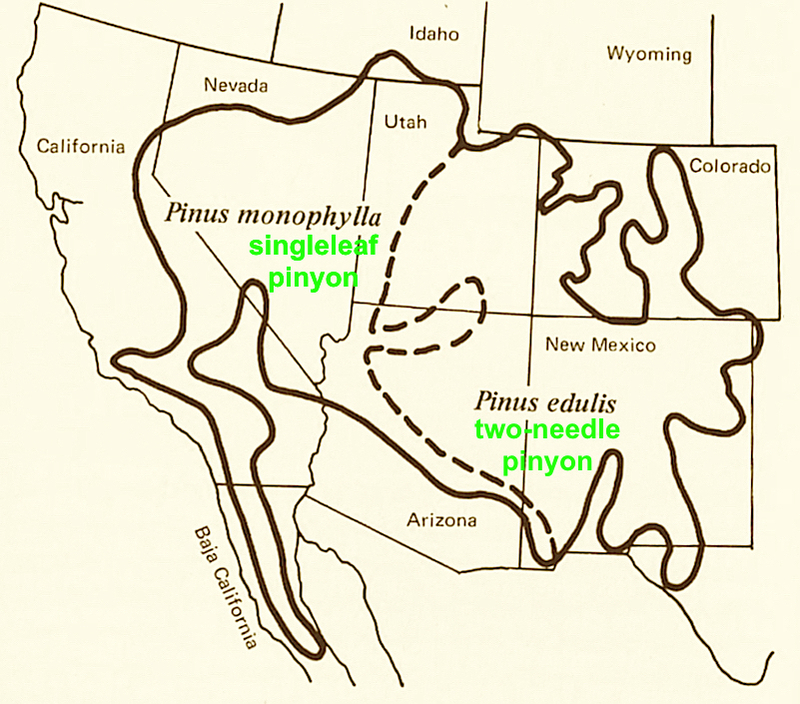 The pinyons generally were taller and grew more densely than the two-needles on the Colorado Plateau. Is life a little easier? 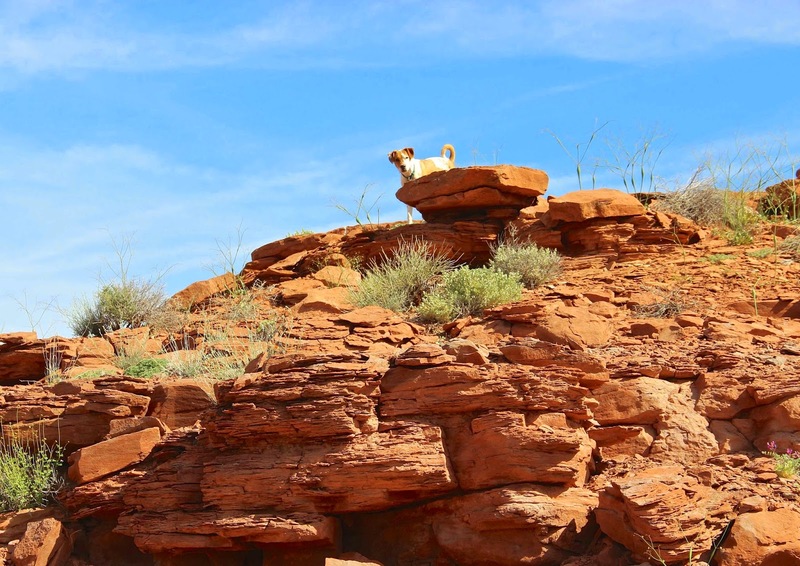 … the cooler climate a bit more hospitable? 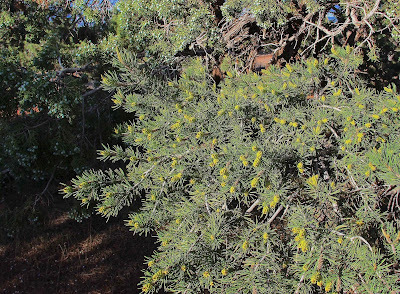 It helps to start life beneath a nurse plant, in this case sagebrush (Artemesia tridentata). An elder’s wise strategy: invest in healthy tissue, let the rest die. The dead may stand for years in this high dry country. 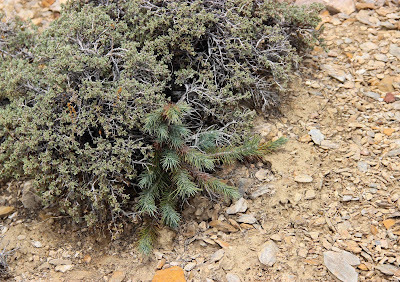 The singleleaf pinyons weren’t as pitchy as the hésho tsítonnê (two-needle pinyons) I saw in Utah. I didn’t find any gum balls on the ground. But there was plenty of pitch around fresh wounds. It's obvious why these are singleleaf pinyons. 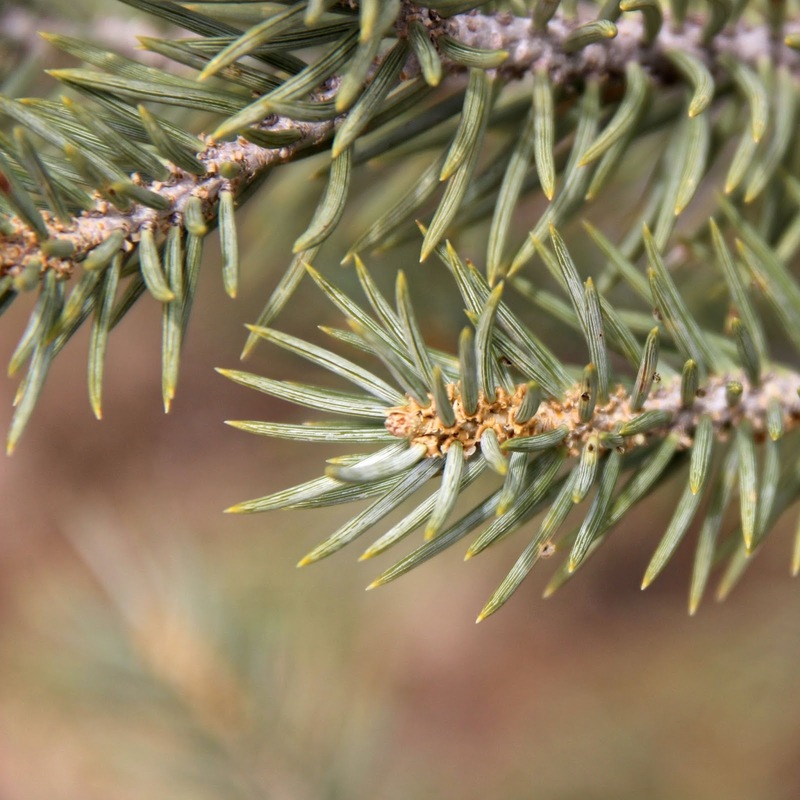 Most pines have 2-5 needles per fascicle, but the singleleaf has only one (a fascicle is a bundle of needle(s) with a sheath at the base). 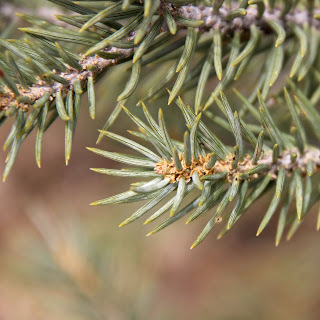 Singleleaf needles are stouter than the two-needle's, and have white lines on all sides – rows of stomata (pores for gas exchange). Click on the next image to see. Cones of the singleleaf pinyon are larger than those of the two-needle. 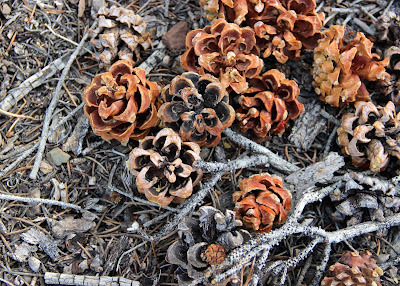 They seemed abundant in the White Mountains ... maybe recent years have been good ones. 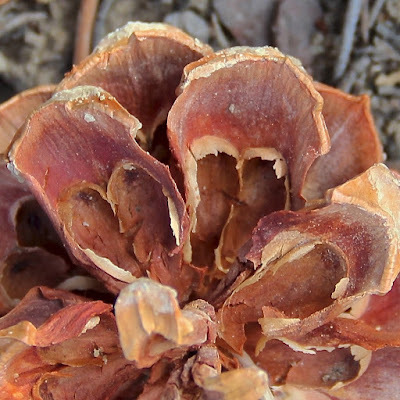 I've read that female cones (the ones with seeds) develop in the upper part of the tree. 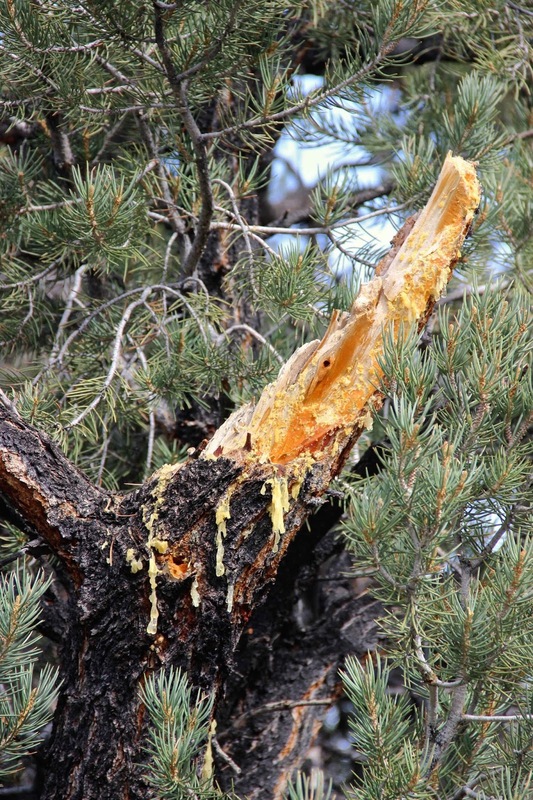 That is what I saw in larger trees. Here's a singleleaf pinyon wearing a beautiful crown of cones. Owens Valley and Sierra Nevada in distance. Each cone scale bears a pair of seeds. When the seeds fall out they leave cone eyes, called he-push in Panamint (Lanner 1981). Pale-colored seeds like the next ones are almost always empty. Pinyon jays know better than to bother with them. They collect only the rich nutritious dark ones (Lanner 1981). 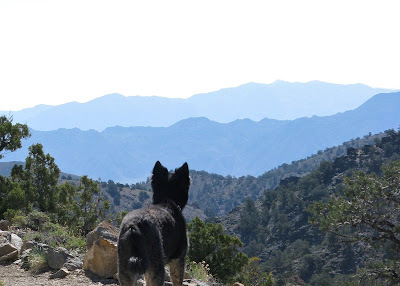 Next I drove east across Nevada and the Great Basin. Wherever I stopped to check pinyon pines, I found singleleafs. Near Ely, I camped in dense second-growth pinyon-juniper woodland. The old charcoal ovens at Ward attested to the youth of the trees. About 150 years ago, they were all cut down to make charcoal for smelters (mining). 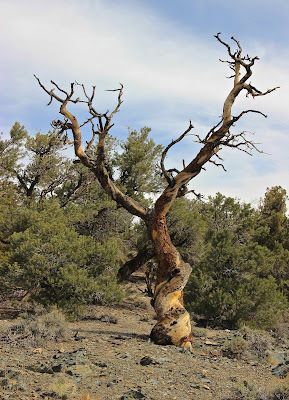 I continued east through Utah to the Colorado Plateau, and was back in the land of the two-needle pinyon. I made a great find at Colorado National Monument. 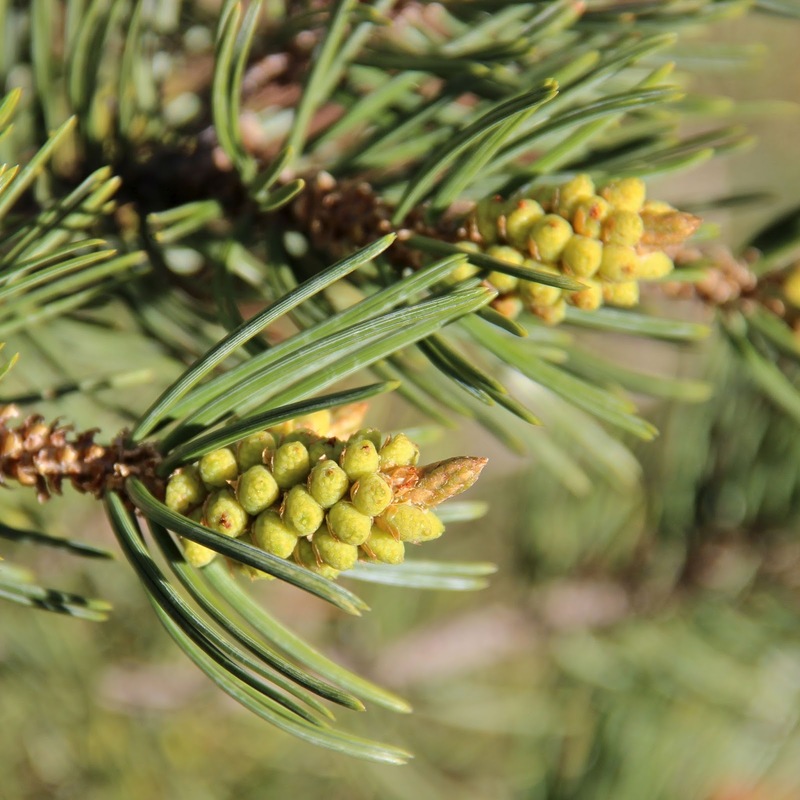 Near the picnic area, the two-needles were loaded with male cones … I’d not seen them before. True to what I had read, they were mostly on lower branches. And the junipers were loaded with berries too, maybe because of runoff from the parking lot. There’s much that is awe-inspiring at Colorado National Monument. 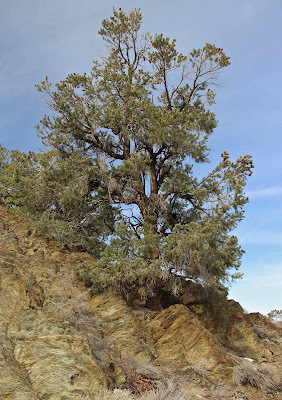 I was especially impressed by the pinyons and junipers that have managed to create woodlands of sorts on the great monocline of the Uncompahgre Plateau. 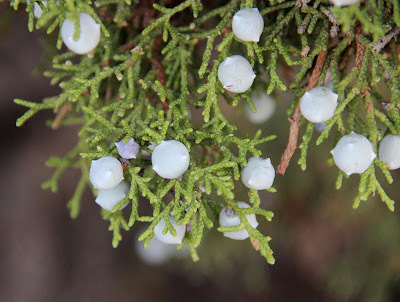 These are small but tough trees! Waring, GL. 2011. 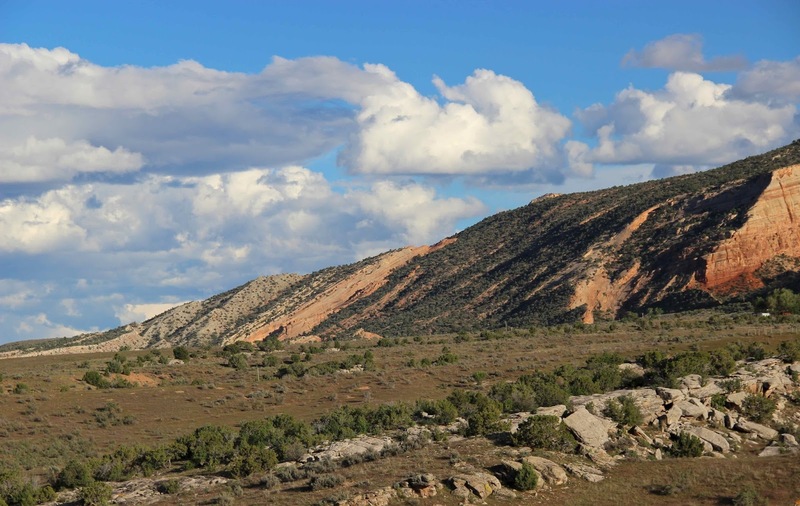 A natural history of the Intermountain West; its ecological and evolutionary story. University of Utah Press, Salt Lake City. Along Utah Highway 163 west of Bluff, I stopped where tourists stop, and took this photo. 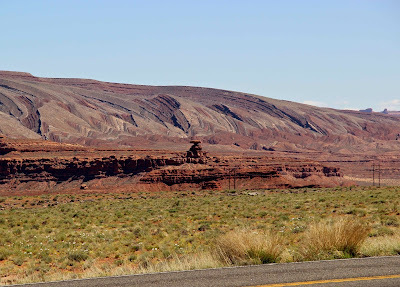 The pinnacle in the center is the Mexican Hat, one of many rock features on the Colorado Plateau curious enough to be named. And if they’re named, people will stop and take photos. But that’s not why I stopped. 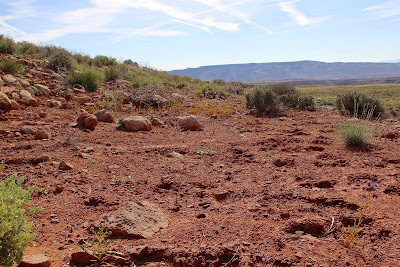 I was interested in the curious slope behind – the west flank of a ridge with many names. Some call it the Raplee Anticline. 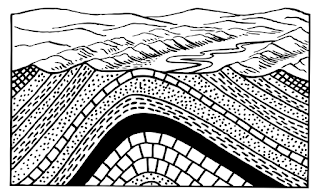 Anticlines are folds that slope down from the crest on both sides. They're often asymmetrical – one side steeper than the other. Others call it the Raplee Monocline. 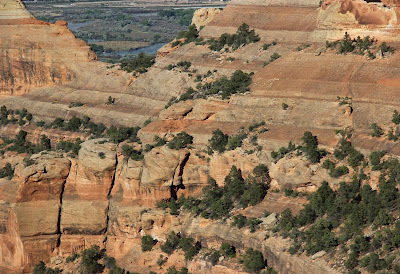 A monocline is an uplift with a slope, usually quite steep, only on one side. 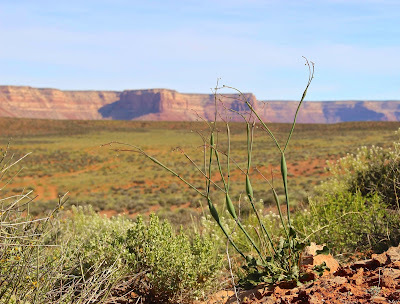 Long dramatic monoclines contribute to the spectacular scenery of southeast Utah – for example Comb Ridge, which I wrote about several weeks ago. 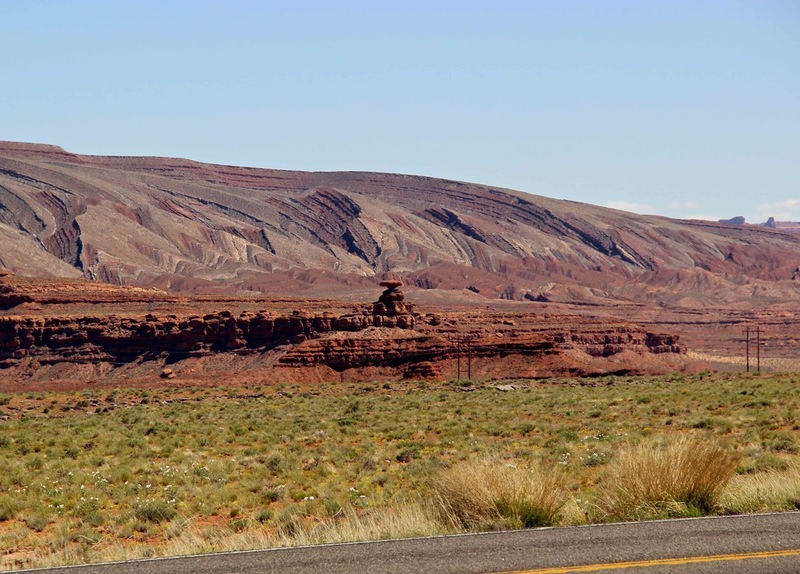 Comb Ridge is part of the monocline on the east side of the Monument Upwarp. 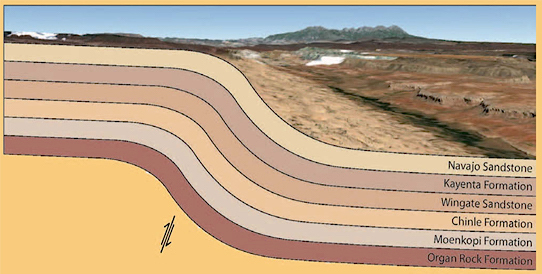 Theoretical view of the Monument (Comb Ridge) monocline in the absence of erosion (after Robinson 2012). 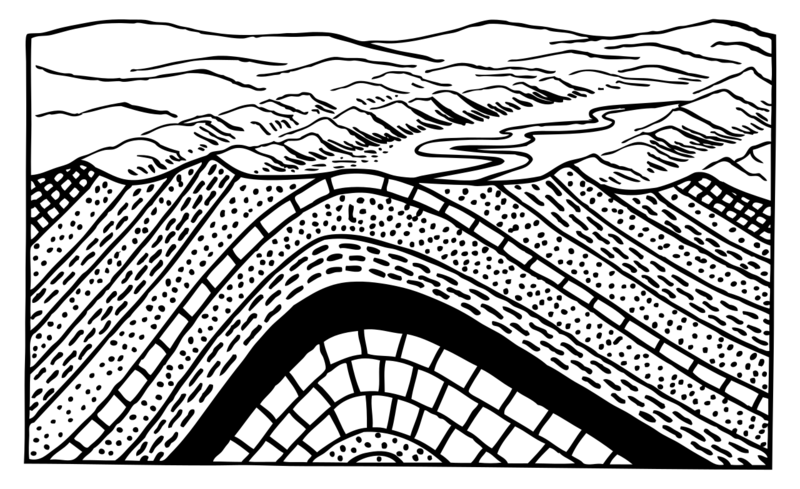 The Raplee uplift is bounded by a very steep fold on the west, but also slopes gently but noticeably to the east. This makes it hard to classify, and it's wise to hedge: “takes on the appearance of a monocline” (Mynatt et al. 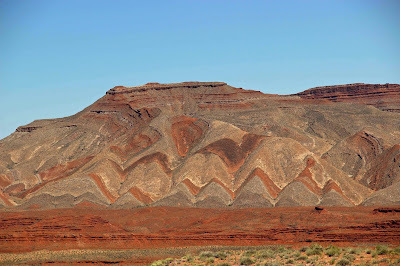 2009); or “Raplee Anticline, more a monocline” (a favorite geoblogger). Or just call it Raplee Ridge. 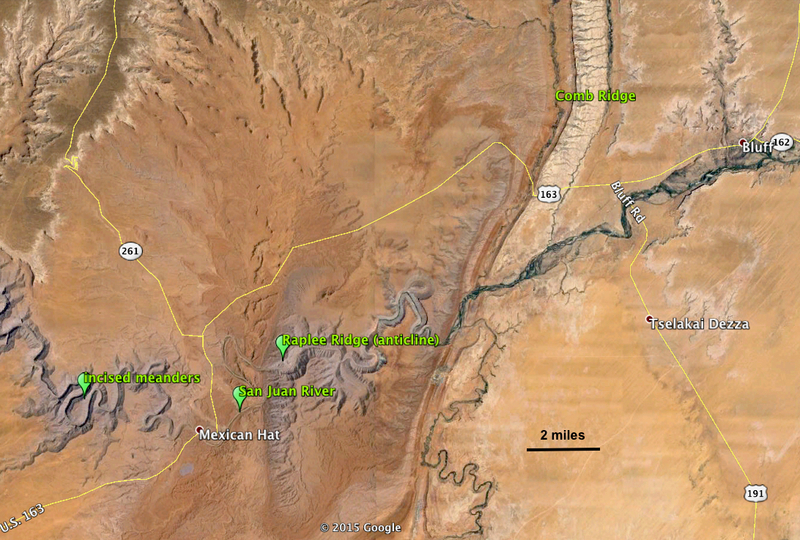 The monocline-like fold is nicely exposed where the San Juan River leaves the Raplee uplift. Cross-section along the San Juan River in southeast Utah. 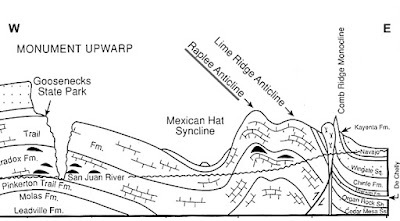 Raplee and Lime are among the many small anticlines superimposed on the Monument Upwarp (modified from Stevenson 2000). 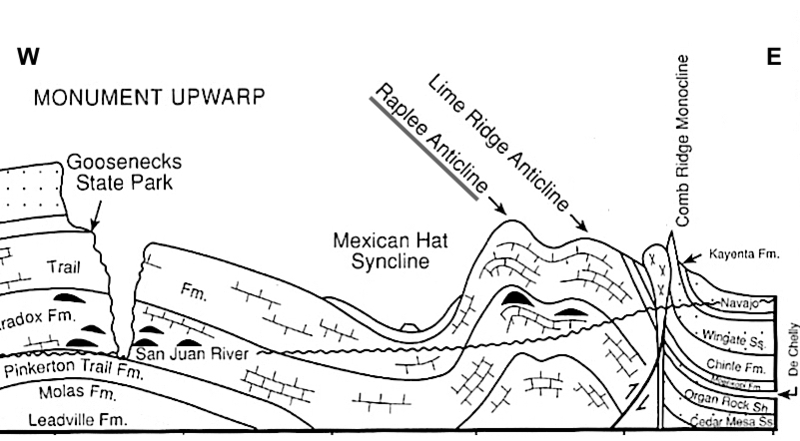 Stevenson (2000) describes Raplee Ridge as one of numerous minor anticlines and intervening synclines (downwarps) on the crest of the large Monument Upwarp. 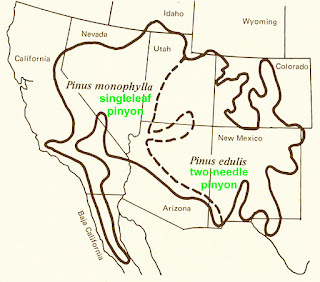 The Monument and the minor folds all date to the Laramide orogeny, when North America was being compressed from the west. 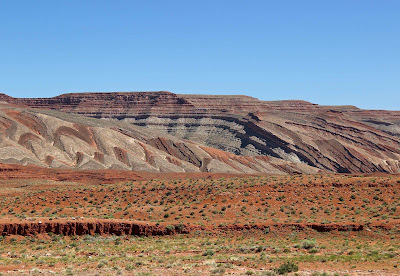 On the steep west flank, runoff has cut deep gullies in alternating layers of red and gray sedimentary rock. 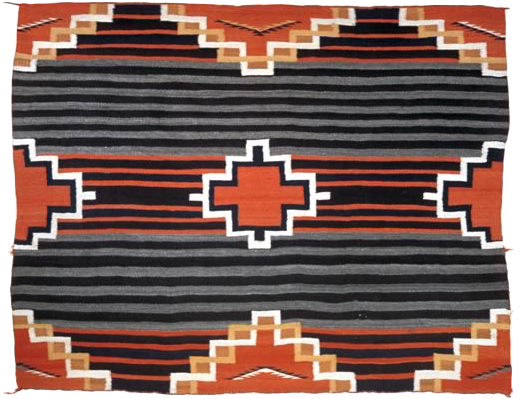 The result is red and gray zigzags suggestive of geometric patterns of Navajo weavings. 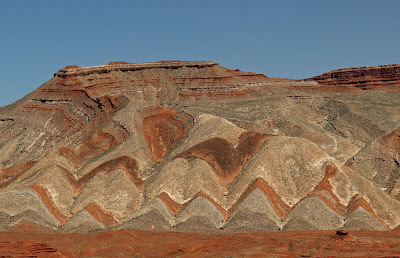 Zigzags “woven” by erosion from red sand- and mudstone and gray limestone of lower Cutler beds (Pennsylvanian-Permian). Older limestones of the Honaker Trail Formation are visible in the lower canyon wall behind (Fillmore 2011). 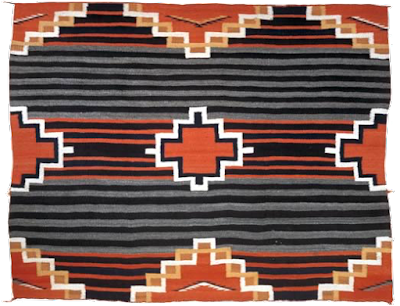 I was familiar with the intricate designs of contemporary Navajo weavings. These are decorative items, works of art. 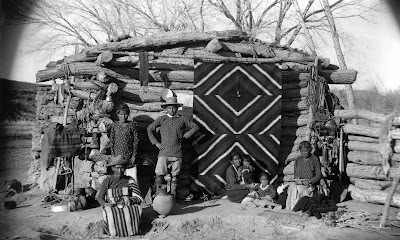 I now know that in the old times weavings were largely functional – dresses, ponchos, saddle blankets, rugs, doors and more. They had to be durable, and makable in a reasonable amount of time. Designs were less elaborate, but still beautiful (source). 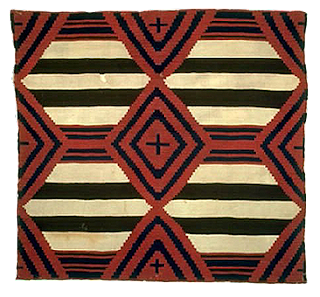 Historic third phase Chief's blanket, circa 1870-1880. The Textile Museum 1976.30.4. Gift of Col. F. M. Johnson, Jr. From Wikimedia. Navajo winter hogan with blanket as a door, 1880-1910; Denver Public Library Digital Collections (Wikimedia). Woman’s-style blanket, third phase, ca. 1885-1900, Cat. No. E-3270; Arizona State Museum University of Arizona, Jannelle Weakly, photographer. 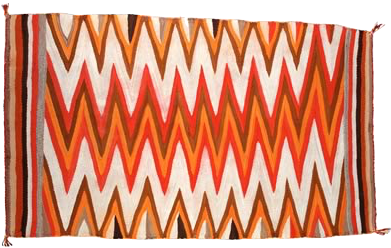 Wedge weave blanket, ca. 1880-1885, Cat. No. 2004-747-1; Arizona State Museum University of Arizona, Jannelle Weakly, photographer. 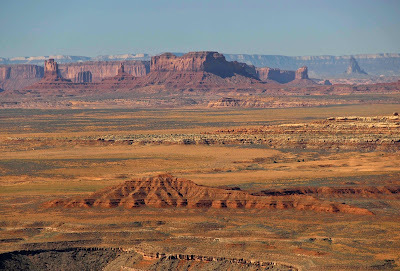 Raplee Ridge lies between Bluff and Mexican Hat, Utah. 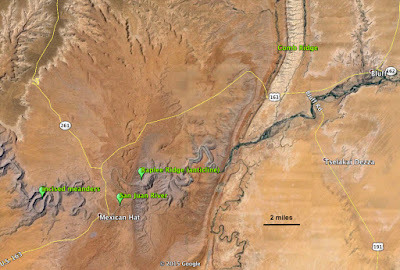 Good views can be had from Utah Highway 163, Goosenecks State Park, and the San Juan River (via float trips). 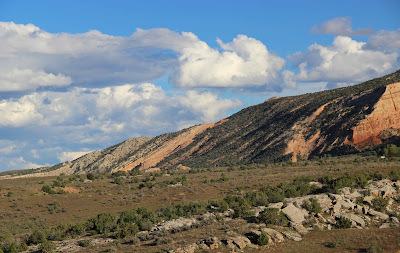 See Ron Schott's neat gigapans of the Raplee anticline here and here. Fillmore (2011) includes a road log for the area. 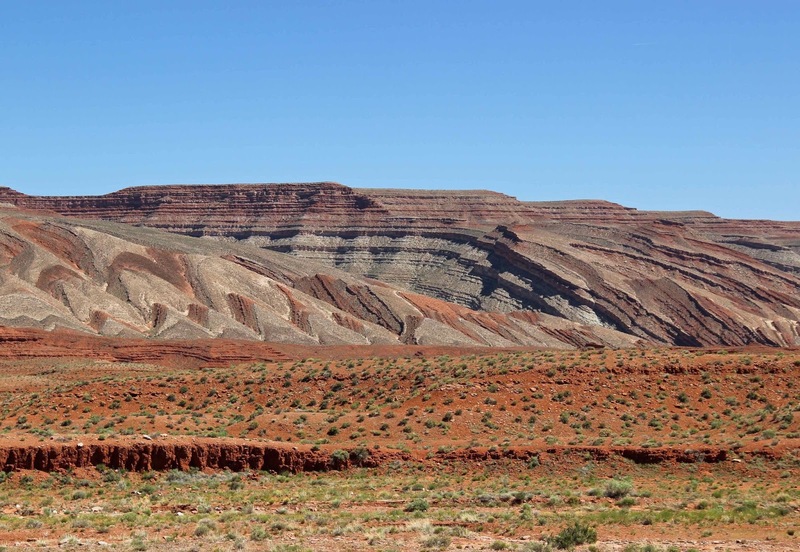 The Raplee anticline/monocline is eight miles long. 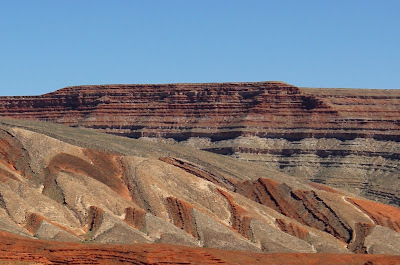 The Comb Ridge monocline is 80-100 miles long (reports vary). Click on image to view. Friendly Ranger at Goosenecks State Park (accessed April 2015). Robinson, M. 2012. 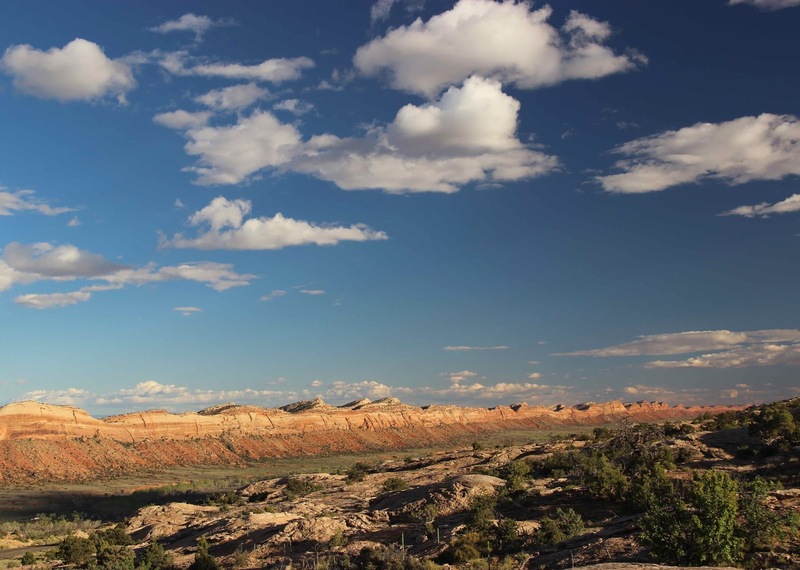 Geosights: Comb Ridge, San Juan County, Utah. Utah Geological Survey. Stevenson, GM. 2000. Geology of Goosenecks State Park, San Juan County, Utah. in Sprinkel, DA, Chidsey, TC Jr., and Anderson, PB eds., Geology of Utah's parks and monuments. UGA Publ 28. University of Arizona. Navajo weaving at Arizona State Museum. Accessed May 2015. “Species of Eriogonum [wild buckwheats] have long been regarded as among the most difficult in North America to distinguish” (source). 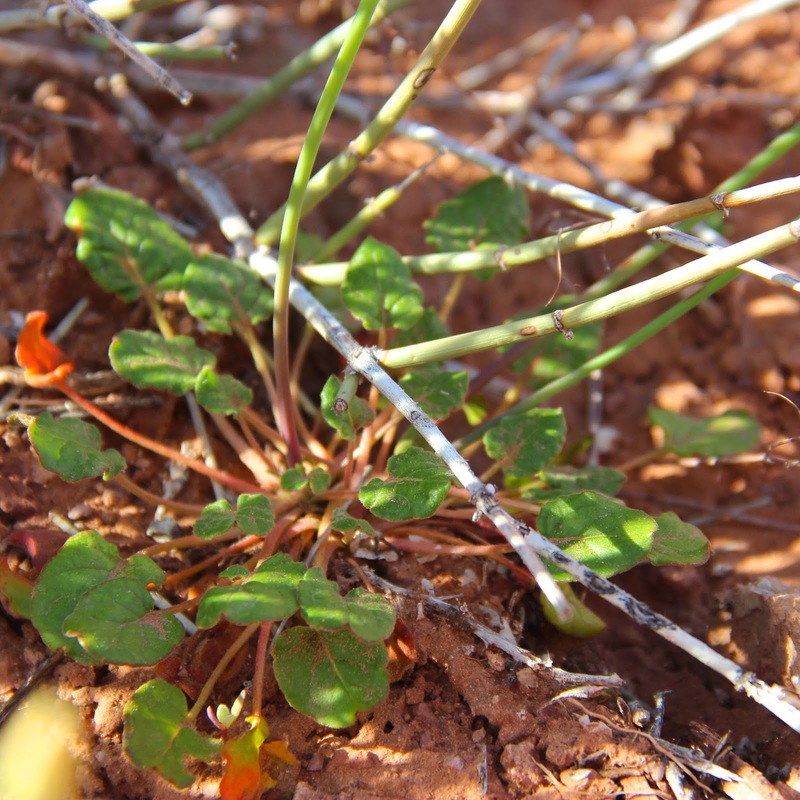 … and the leaves are hardly distinctive. 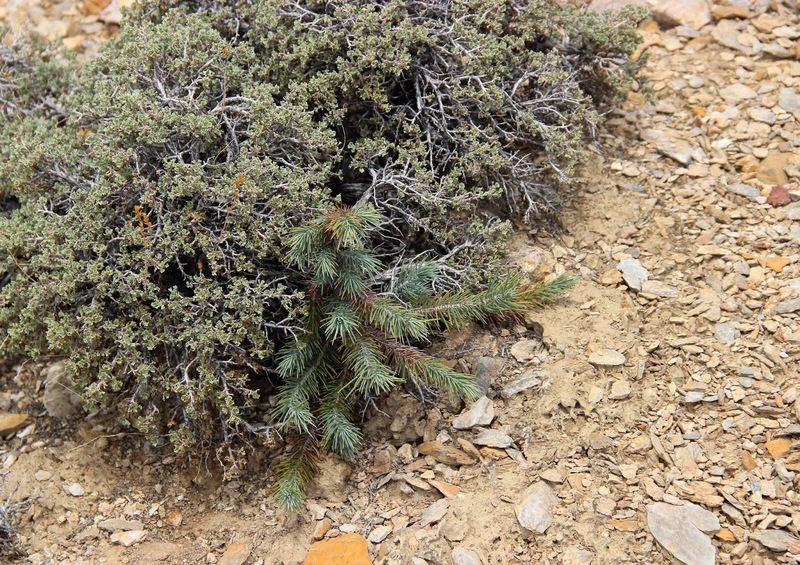 Click on image to view plant in center of photo. It’s the … FANFARE!!! … desert trumpet, Eriogonum inflatum. 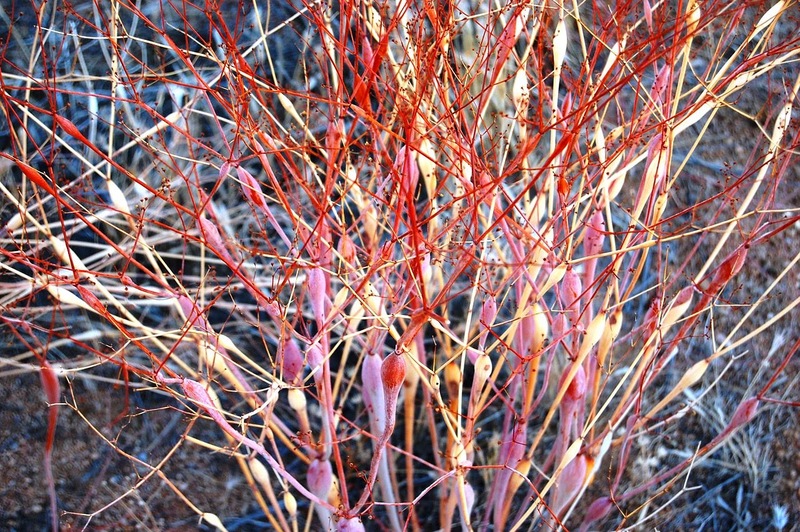 The photogenic inflated stems and branches give it away. Swollen main stems may be an inch across. Looking down into the very open spreading inflorescence (flower “cluster”). Desert trumpet grows in Arizona, southern and east-central California, western Colorado, northwestern New Mexico, central and southern Nevada, southern and eastern Utah, Baja California and Sonora. It does well on harsh arid sites (source). 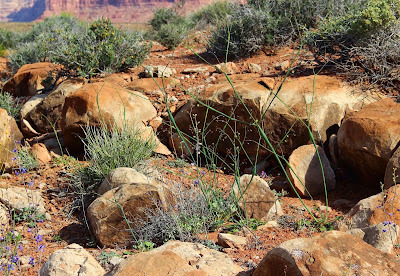 Desert trumpet in a rock garden in southeast Utah. Plants are close to two feet tall. Blue flowers belong to desert larkspur (Delphinium). Once upon a time someone found insect eggs in stems of desert trumpet, and speculated that the hollow swellings were abnormal growth caused by insects. Speculation became knowledge, which persists in spite of efforts to get rid of it (read more here, here and here). Insects sometimes lay eggs in the inflations, but plants grow them even where there are no insects – in labs for example. 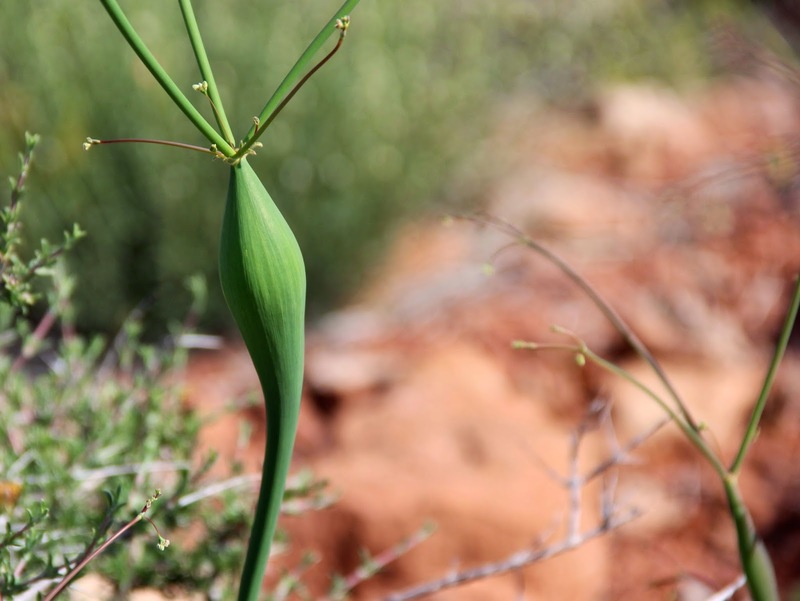 Inflated stems are a boon to photosynthesis. 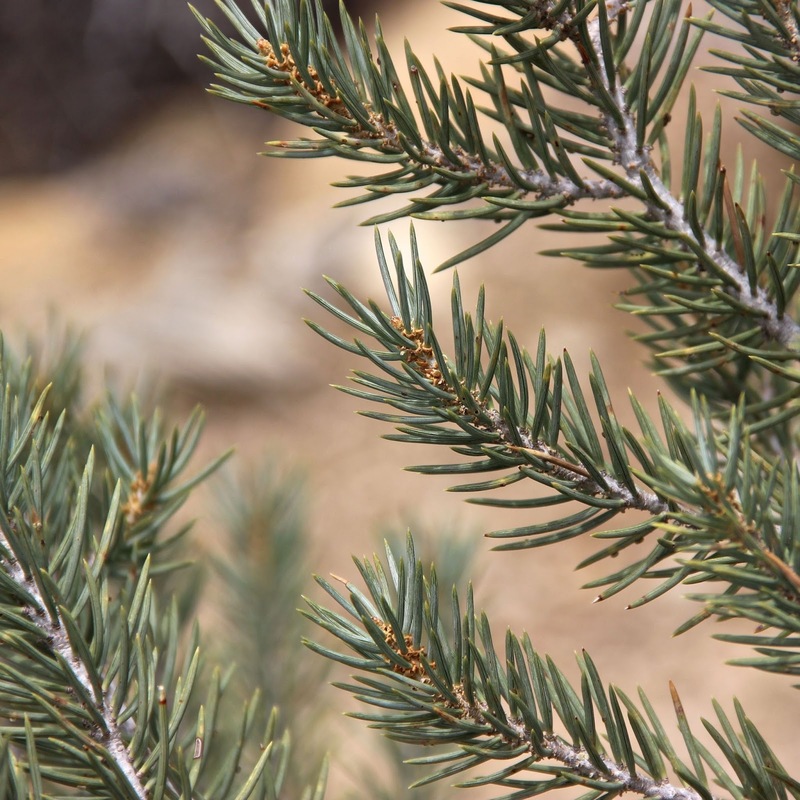 They store carbon dioxide (unless insects drill holes to ventilate their nurseries), and provide up to 75% of a plant’s photosynthetic surface. Even better, stems and branches remain green and photosynthetically active into summer, after the leaves have wilted (Waring 2011). 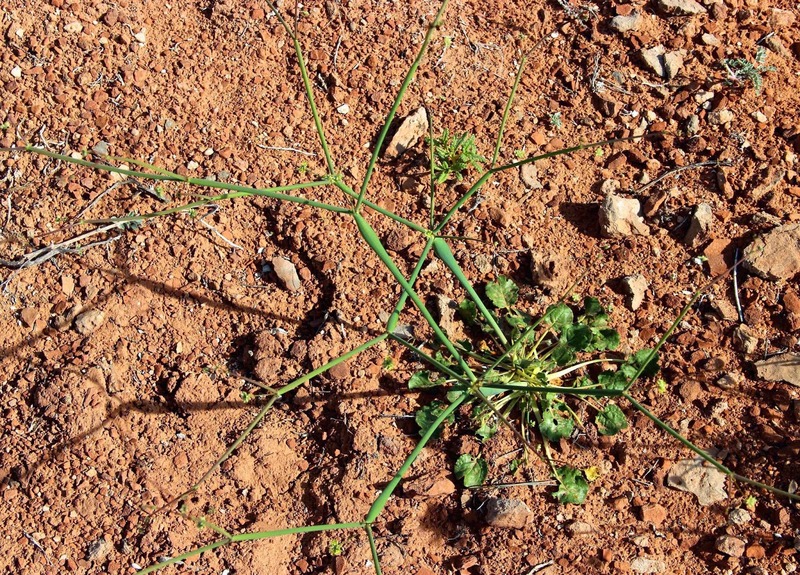 Some desert trumpet plants do not have inflated stems. “… this feature is partly a function of available moisture: the drier the conditions, the less pronounced the inflation. 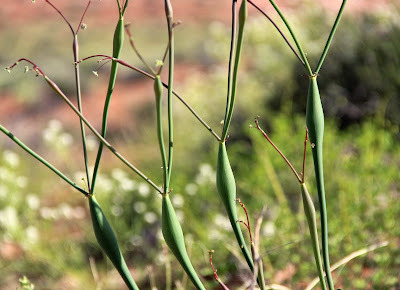 Stems produced in the summer tend to be inflated less frequently than those produced in the spring” (source). 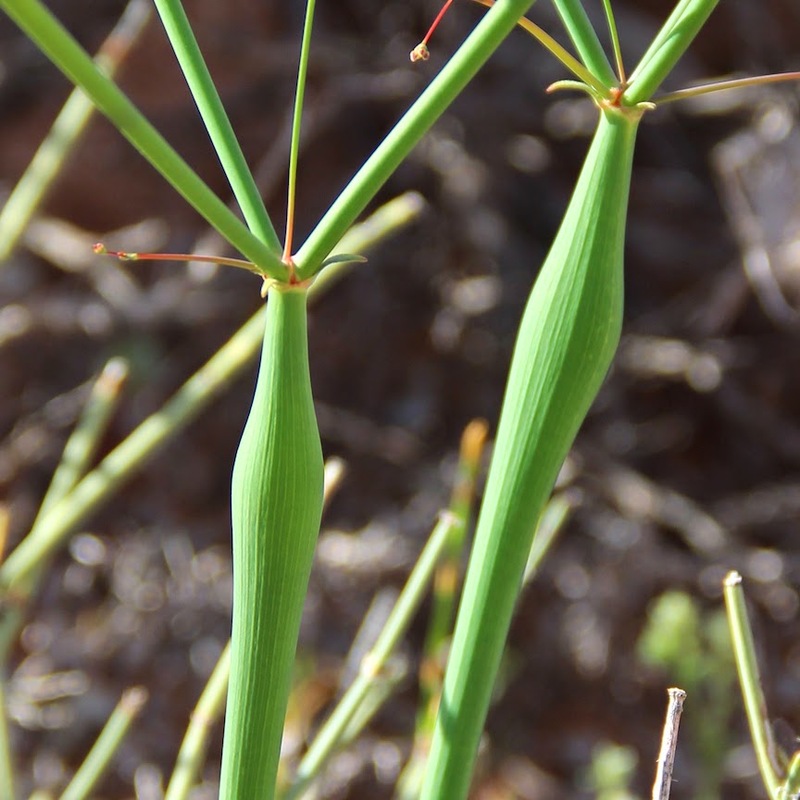 Non-inflated stems were the basis for an old variety that’s no longer recognized. 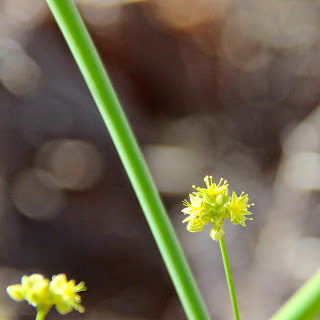 Too bad, it had a neat name: Eriogonum inflatum var. deflatum. 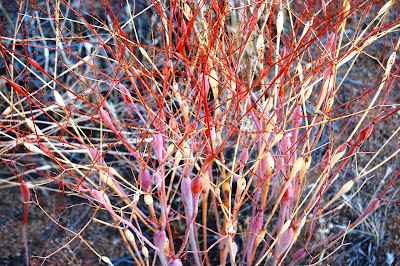 By fall the stems have dried and turned brown, but they usually stay on the plant for at least another year. 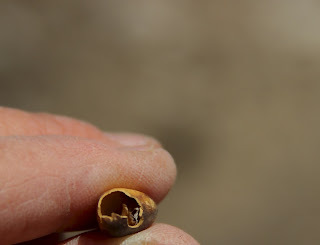 You can take a dried stem and slice off half of the inflated part lengthwise to make a pipe, as some Indians did. 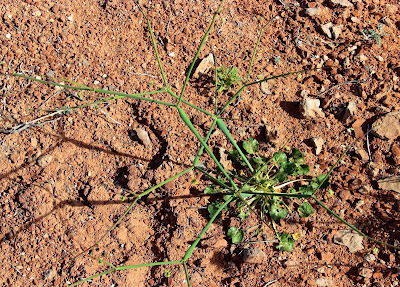 This is why desert trumpet is also known as Indian pipeweed. Another name is bottle stopper. Desert trumpet/Indian pipeweed/bottle stopper in fall (pale stems are a year older). Source. 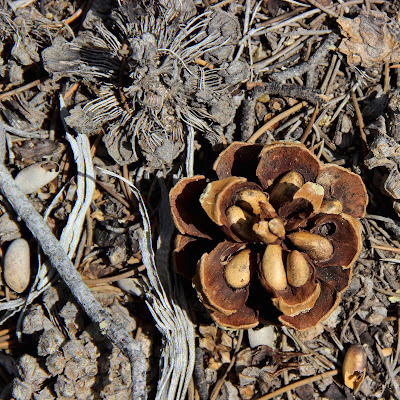 Emmie found desert trumpets on the crest of this small ridge north of Goosenecks State Park. 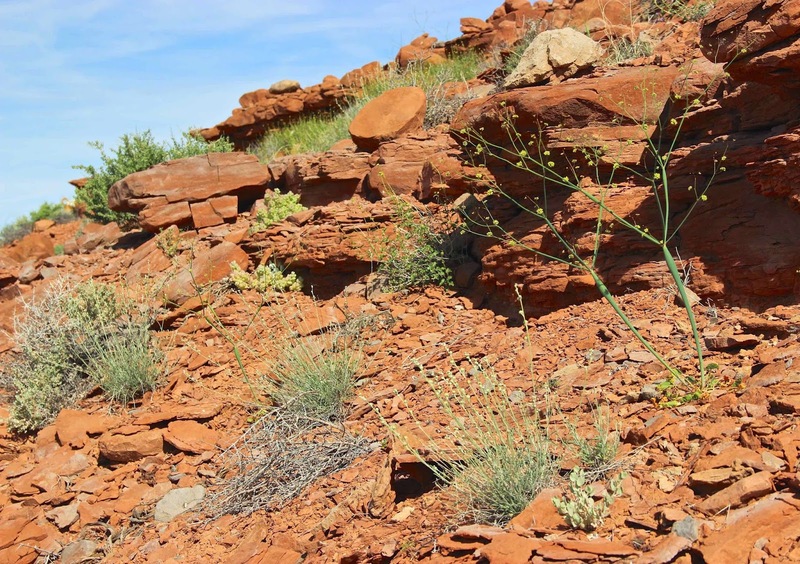 Schneider, A. Eriogonum inflatum (desert trumpets) in WILDFLOWERS, FERNS, & TREES of Colorado, New Mexico, Arizona, & Utah [online]. Accessed May 2015. Waring, GL. 2011. 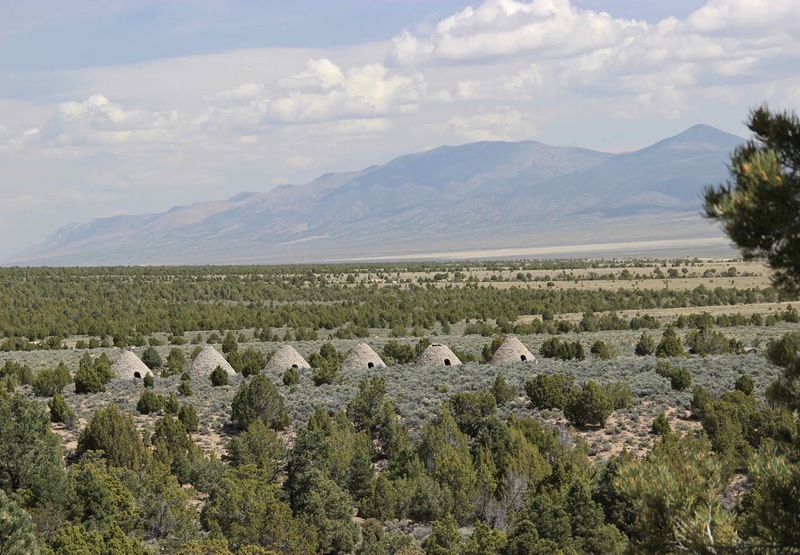 A natural history of the Intermountain West; its ecological and evolutionary story. Salt Lake City: University of Utah Press.